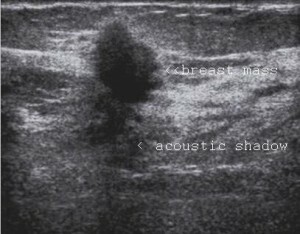 Breast ultrasound is a diagnostic breast imaging procedure used to determine if a mass observed on a mammogram is a solid abnormality or a fluid filled structure such as a benign cyst. If the mass is solid, a biopsy will be performed to determine if the mass is benign or a cancer. Cysts are fluid-filled sacs that grow inside the breasts. These sacs sometimes form when normal milk glands in the breast get bigger. A woman can have a single cyst or many cysts at a time. Breast cysts are common, particularly in women age 40-60. Although larger cysts can sometimes be felt as “lumps”, many cysts cannot be felt by physical examination. Cysts that cannot be felt may be found during a screening mammogram. These cysts can often be drained using ultrasound guided fine needle aspiration. When an ultrasound exam reveals a suspicious solid breast abnormality, the radiologist and your doctor may recommend an ultrasound-guided biopsy. 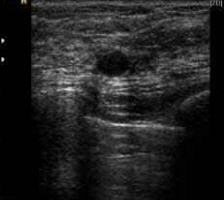 Because ultrasound provides real-time images, it is often used to guide biopsy procedures.